31st March 2019: The benefit-sharing ceremony between the Menjong Sorig Pharmaceuticals Corporation Limited (MSPCL), a State Owned Enterprise and the Namther Menrig Tshogpa, a community-based group in Langthel Gewog under Trongsa Dzongkhag was held on 31st March 2019 at Langthel Gewog in presence of the National Biodiversity Centre (NBC), MoAF, a national focal agency for the implementation of the access and benefit-sharing (ABS) regime in Bhutan. The MSPCL and NBC with the support from the UNDP-GEF Nagoya Protocol Implementation Fund (NPIF) project called “Promoting the Application of the Nagoya Protocol on Access to Genetic Resources and Benefit Sharing in Bhutan” has been implementing the ABS scheme with the Namther Menrig Tshogpa. The MSPCL has been granted access to Emblica officinalis (Himalayan gooseberry) and Sapindus rarak (soapnut tree) for the production of anti-ageing cream and a natural handmade soap on mutually agreed terms and conditions through negotiations and execution of an ABS agreement with the Namther Menrig Tshogpa with NBC maintaining oversight. This ABS scheme was a tripartite ABS agreement between two government entities and the local community. As per the terms and condition of the ABS agreement, MSPCL agreed to share the 5 % of the gross ex-factory profit annually to the Namther Menrig Tshogpa from the sale of the products developed from the utilization of the biological resources accessed from the community. Further, they agreed to share 2 % of the profit to the Bhutan Access and Benefit Sharing (BABS) Fund as a symbolic contribution to support the biodiversity conservation and sustainable initiatives in the country. The cheque amounting to Nu. 4350.00 has been given to the chairman of the group as a benefit for the year 2018. The cheque amounting to Nu. 2491.00 has been received by the representative from NBC as a contribution to the BABS Fund. In addition to receipt of the profit, the community had received other benefits which include the payment of the premium price for the raw materials, distribution of the harvesting tools and the sustainable harvesting capacity building programs. Further, a set of products developed through this collaboration were also distributed to the members of the community. Although the amount received by the community may be small in the beginning, it is going to be substantial in the coming years as the products capture the better market. Similar benefit sharing ceremony will be held between Bio Bhutan and the Jom Dagam Ngomen Tshogpa, Dagala Gewog, Thimphu Dzongkhag which is a bipartite ABS agreement between the private company and the local community. The main objective of supporting such ABS initiatives is to create a platform for the enhancement of livelihoods of the local communities and promote the participation and leadership of the local communities in the conservation of biological diversity as well as adopt ABS principles in the work process by companies. In order to facilitate the process of implementation of ABS regime in the country, there is the Access and Benefit Sharing Policy of Bhutan 2015 and the Biodiversity Act of Bhutan 2003 in place and any access to Bhutanese genetic resources and associated traditional knowledge is guided by these legislations. 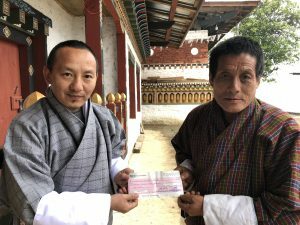 With such legislation in place and Bhutan being one of the bio-diverse countries with the farsighted leadership, Bhutan has a potential to tap benefits from biodiscovery research engaging local communities and companies creating a niche market for the nature-based products in the national as well as international market. The National Biodiversity Centre, Serbithang is pleased to invite sealed bids from eligible supplier for the supply and maintenance of Laboratory equipment and glass ware for BP & ABS Section, under National Biodiversity Centre, Serbithang. The National Biodiversity Centre, Serbithang is pleased to invite sealed bids from eligible supplier for the supply of Lab Equipments and Consumable for AnGR Section, under National Biodiversity Centre, Serbithang. The National Biodiversity Centre, Serbithang is pleased to invite sealed bids from eligible supplier for the supply of Gene bank equipments and safety gears of PGR program, under National Biodiversity Centre, Serbithang.